This is going to be a short post because I had a very long day. And all I want to say today is how my day started and how it ended. My day started with my sobbing, before I left for work, because I had allowed myself to get in touch with some fears about my health, which I had never really allowed myself to feel before. These fears were a collection of old fears from my childhood and some current fears that I do need to live with, but often deny and suppress. And this morning, because I was talking about these fears to somebody I trust, I allowed myself to feel the fears in a new, very primal way. Then I went to work and lots of things happened. Then, tonight, I went to a meeting to start planning a high school reunion. I traveled about 20 miles and about 45 years back in time, to meet with some people with whom I spent several formative years, but whom I have not seen for quite a while. When I was traveling those 20 miles to the meeting — and because the memories of the past were right there — I had some fears about that meeting. I thought that perhaps these people at the meeting might have judged me in high school and might also judge me tonight. But when I got to the meeting, I realized that everybody there wanted to be there because they felt an urge to reconnect. And people were as kind as could be to me. And I was happy to be there with them and to start planning our high school reunion, together. So, dear reader, that was how my day started and how my day ended. And I’m happy to be here, now, too. Thanks for reading. I’m typing this post while waiting for an appointment this morning at The Pacemaker Clinic. As I’ve mentioned elsewhere in this blog, I’ve had a pacemaker since I was 10 years old. I Am The Longest Surviving Person in the World with a Pacemaker. * I used bragging initial caps in that previous sentence because of something new I’ve been doing lately. I’m being open, even proud, about this. A couple of summers ago, at a group therapy conference I attend every year, I was participating in a day-long therapy group. During the afternoon, I revealed to the group my Big Secret for People Who Don’t Know Me: the heart stuff and how that affected my childhood. I also described my fears about how revealing this might screw up my connection to the other people in the group. I was afraid that they would withdraw, or see me in a very different way: as The Person With The Pacemaker. There was this really cool woman in the group, who was wearing these great shoes. What she said made a big impression on me. All year, I considered getting a t-shirt. And a week before last summer’s conference, I ordered this t-shirt on-line. During the day of the conference, I had a jacket over the t-shirt (I was too self-conscious to have it out there completely), but I did show it to the people from my group the year before. And they thought it was quite cool. Okay. Time for my appointment. 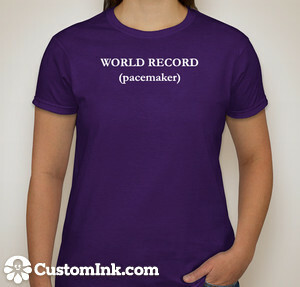 The people at the Pacemaker Clinic are definitely on My Team, and I’ll write more about them in a post here, very soon. * Note: In late January 2014, almost a year after I published this post, I heard from somebody who has had a pacemaker longer than I have. See the comments below, for more about that. I actually am no longer wearing the t-shirt. I’d like to send the t-shirt to the real champ … we’ll see how that goes! And I know I’m not alone in feeling this way. But, I wonder if my focus on honesty is unrealistic. I wonder if my childhood experiences have made ma kind of an Honesty Fanatic. I wonder if my childhood experiences have made me Too Judgmental about other people’s honesty — not allowing for human imperfection. Even when I’m a little bit ill, being sick affects how I feel about myself. I’m not sure whether that’s common for people. I haven’t really checked that out in any real way with other people. In other words, I haven’t used the helpful skill — an “antidote” to the Cognitive Distortion of Mind-Reading — of Reality Testing. To put it more simply, I haven’t asked other people, “When you are even slightly ill, does it affect your sense of self worth?” I mean, I know that serious and chronic illness can definitely affect people’s sense of self-worth, but A COLD? The reason I haven’t really checked that out before is this: I assume that I’m different from other people in how illness affects me, because I dealt with so much illness when I was a child. So I just assume that I’m “weird” when it comes to that. So tonight I’m thinking that maybe I’m “weird” — also — about other people’s honesty. Because this is how I am in relationships: if I think somebody been dishonest or deliberately misleading, it has a major effect on how I relate to them. Now, I have seen other people be very All or Nothing about Trust issues. I’ve heard people say about themselves, “Once somebody breaks my trust, that’s it. I can’t forgive them.” I’ve also witnessed other people be much more “forgiving” about trust issues — including resuming a relationship when their partner has cheated on them. I don’t know how to gauge What’s Normal or What’s Appropriate when it comes to Trust and Honesty. I think I’m pretty rigid about the issue of honesty. Actually, the word “rigid” is self-judgmental. It’s a form of labeling, one of the 13 cognitive distortions. So I won’t use the word “rigid”, but I will say this. If somebody is dishonest or misleads me, I get really upset when I find out about that. I withdraw. It takes me a while to trust them again. So, how “normal” is that? And if that’s not a useful question, then how about this question: How can I negotiate the issue of trust in a way that’s helpful for me and the people I love? But I’m not sure what to do tonight. I woke up at 1:30 AM and had trouble getting back to sleep. I remembered reading that some sleep specialists suggest this: if you have trouble sleeping, don’t lie awake in bed too long — get up and do something else. So after I had stayed awake until 2:30, I got up, left the bedroom, and started this post. But now it’s 3:03. And I’m not sure whether to continue with this post or to try to go back to sleep. Because there’s a direction I could take in this post, now. I could share something that happened to me when I was a kid, that has made Honesty so important to me. To share or not to share that memory? That is the question. To write that now or later, during this 24-hour span of Day 51? That is the second question. Question #1: Should I share that childhood memory? Answer: Perhaps. And maybe soon. I HAVE written down that memory elsewhere, so I could copy a version and paste it, pretty quickly. But that would still take time and energy, and doing that right now probably wouldn’t help contribute to getting back to sleep. Question #2: Should I write that now or later, in this 24-hour period? Answer: It turned out that was too restrictive a question. My answer is this: I won’t write about that on Day 51. This is, I have time to write about this childhood memory, and to write more about the issue of honesty and trust. That is, I’ll write more in future posts, and finish this post now. Farewell, for now, and thanks for reading. So, I’m home. And while I love traveling, very much, I am definitely somewhat “on guard” when I’m away from home. Especially when I’m traveling on my own for most of the trip. So now that I’m back in my home base, and relaxing a bit, I’m realizing some things, which I’m going to jot down here, before I re-engage — for the first time in over a week — with my typical morning routine (including taking my son to school and going back for my first day at work). These realizations feel new to me. I think I’m having them, this morning, partly because of the personal growth I’ve been experiencing — already! — during This Year of Living Non-Judgmentally. However, these realizations feel new, probably because I’m experiencing them in a deeper, more profound way. And, even more importantly, I’m making these realizations more real, right now at this point in my life, because I’m bringing them out from a strictly internal sphere and sharing these with the external world. Or to re-state that last sentence more plainly — I’m not keeping these thoughts to myself anymore. I’m sharing them with other people in my life and with the whole friggin’ Blogosphere, right now! So where was I before those digressions? Oh, yes. I have trouble believing that other people truly love me and will be there for me, no matter what. There is the punch-line — the important realization — right there, in an italicized nut-shell. So now I’m going to write a little bit about where I think this “trouble” comes from, for me. I think this issue is related to my childhood, when I was hospitalized very frequently for heart issues. During those “primitive” times of healthcare — the early 1960s — my parents were not allowed to be with me in the hospital, outside of regular visiting hours. Anyway, between the ages of 9 and 13, I was in the hospital a lot, dealing with lots of operations and scary things (and people), on my own. So even though I’m sure my parents loved me, they couldn’t be with me during some times when it really mattered. And I guess, maybe my young self believed — on some level — that if my parents really loved me, they would have fought tooth-and-nail, like tigers, to stay with me, no matter what. But, again, it was a different time. And I think all of us — my parents and me — didn’t want to piss off the People in Control — the doctors at the hospital. I know that I had this childish fear: if I DID alienate the doctors and nurses, by not being a good (maybe even perfect!) patient, these all-powerful people might let me die. And I think that my parents, even though they had the wisdom of adulthood, really wanted to please The Powers That Were, in the Hospital. I’m assuming my parents did not want to alienate the doctors and nurses who were taking care of me, by being Uncooperative, Troublesome Parents. (For example, fighting tooth and nail to stay with me, like tigers). I guess both my parents and I wanted to stack the deck in our favor with the doctors. Maybe everyone in my family believed, back then, that if we were really good and didn’t alienate the hospital staff, we would have had a better chance to survive these experiences, in the best shape possible. I’m realizing that those fears were untrue, because doctors are trained — in medical school — to keep people alive, whether or not they like them. Even if we had been Bad Patients (or Bad Family Members of Patients), I think I still would be alive today. But I wonder if my parents and I were (or are) alone in responding to the medical community that way. When people seem to have life-and-death power over you, maybe a lot of people deal with that by being compliant, by not rocking the boat, by being as perfect as they possibly can be. If you, dear, reader, feel an urge to comment about what you read here in this post, I welcome your comment, as always. But, no pressure to comment. I don’t need you to be a perfect reader, or compliant with my requests. Not at all. And, I have to say, it’s good to be home. I want to ask you, dear reader, what your assumptions are about the meaning of the phrase “The Next Right Thing.” Maybe you’ve heard it before; maybe you haven’t. In any case, what do you think it means? (Actually, if this were a game show like “Jeopardy”, thinking music would be playing now. Okay, now that you’ve had some time to think about what “The Next Right Thing” means to you (assuming that the “Jeopardy” theme song hasn’t obliterated all other thoughts from your mind) (if so, my deepest apologies) …. I will now Google that phrase. I know that “The Next Right Thing” is a phrase, or slogan, associated with 12-step programs. I have witnessed many people use that phrase as a guidepost. I’ve seen them use it as Something That Helps — in their personal path of recovery, in moving forward, in letting go of judgment, in so many different ways. I have felt grateful and privileged to witness all that. I planned a party for several weeks; now that’s over. I’m going off on an adventure tomorrow, flying in a plane by myself to somewhere I’ve never been before. And I haven’t started packing! I have a friend staying over, and what I’d really like to do is just hang out with her, but I’ve got all these things I should be doing. And I’m not feeling great, physically. Nothing serious, just some muscle aches and the same damn cold lingering on, but the physical stuff does have an effect. Anyway … so where was I, before the parentheses? What the hell is the next right thing? How can I figure THAT out? I’m so overwhelmed! Well, here’s the deal. There are SEVERAL Next Right Things I could choose right now. I could start packing. I could tell my friend I need a couple of hours today for myself. I could get a massage to relieve the muscle aches! And, actually, I already did do one Next Right Thing for myself this morning. I wrote this blog post. I just checked the temperature on my phone. Well, here’s one way to tell THIS story. Going out this morning will be an interesting test of what it will be like for me — the day after I wrote in this blog about how extreme weather affects my sense of safety (and when I’m still not back to baseline, health-wise). And it’s also helping this morning, to share my reactions in today’s post — especially that initial, primal THUMP of dismay I felt when I saw that tiny digit on my phone. It’s a ONE, for heaven’s sake. ONE degree. So, yes, that scares me. This is a situation where the smallness of the number is bad. I’m not talking golf, blood pressure, or “bad” cholesterol, where smaller numbers are reassuring. In this situation, numbers considerably smaller than normal are dangerous — like the realms of salaries, grades, and the heart rate of a child. So it’s more dangerous out there, dear readers. But as I said earlier in this post, writing about this, sharing this with you, feeling not-alone with this, is helpful, especially as I’m gearing myself up to go out and meet it. And as I’m preparing myself right now, about to put on my layers of armor and venture into The Land of One Degree, I’m feeling …..
And rather than feeling beaten down — as I did when that fearsome and shocking 1° popped up on my cell phone — I actually can feel a sense of excitement. I will pass through this, triumphant. I will beat this dastardly degree! I mean, it’s only a puny little ONE, for heaven’s sake. Day 23: 8 Degrees of Safety. I went back to work today, Wednesday, after being sick for four days, and it was really, really cold outside. It was 8 degrees, Fahrenheit, when I left the house. I bundled up, really well, for protection. And everything went okay. Nothing went awry. My trusty car started up, right away, even though it had sat idle since Saturday. And although I had to wait outside for a shuttle bus for a little while (my parking lot is a 20-minute walk from the hospital where I work), my bundling had done the trick. I wasn’t in too much pain during the wait. I could still really feel the cold through all the layers I’d piled on, which felt very freaky, but I was fine. So I made it to work, no harm done. However, I’ve noticed that whenever it’s extreme weather outside, that affects my sense of safety, even when I’m indoors. I’m more aware of our human physical fragility, I guess. Knowing that the outside environment is considerably more hostile than usual has an effect on me. I feel more anxious, careful, subdued, vigilant, serious. Getting in touch with other aspects of my nature — my humor, openness, and sociability — takes more effort. And I pretty much kept to myself, avoiding any contact with strangers, the whole day I was away from home. I think that’s a reflection of a general “truth” for me. The safer I feel in my environment — the more I’m able to trust that pain is not imminent — the more I can interact freely with others, and the more in touch I can be with the “higher” parts of my nature. This is tricky to write about, since the word “higher” implies judgment, doesn’t it? At this moment, I’m not sure what to call those other parts of my nature — the humor, the openness, the sociability. For some reason, I want to call those parts “vulnerable” right now. Are they more vulnerable, though? I feel like those parts show strength. However, to show humor, openness, and sociability implies a trust of The Other Person, I suppose — that whomever we interact with will be accepting enough of the interpersonal effort. So maybe showing those sociable parts implies a certain level of bravery. Whenever we interact with somebody, we risk rejection, I guess. Anyway, I’m going to end it here, dear reader, trusting that this post is good enough to publish today. I also hope that if you have thoughts and questions about this post, that you will feel safe enough — no matter what the weather is outside as you’re reading this — to express them, if you choose. Thanks for reading, as always. Day 22: Junket, oui. Judgment, non. I’m staying out of work today. And I’m glad to report that I’m doing pretty well letting go of any self-judgment about that decision. Which is great, because it’s unpleasant enough to feel bad, without feeling bad about feeling bad. So I’m letting go of judgmental thoughts. And I’m having Junket thoughts, instead. In the likely case that you’ve never heard of Junket, dear reader, it’s a pudding that my mother used to make whenever I was sick. I assumed that it was long-gone, but Google tells me that it’s still out there. Wow. It’s nice to see the old package again. It’s true that my mother wasn’t exactly a gourmet cook, but I liked what she cooked for us. There was a consistency and comfort associated with her revolving repertoire of main dishes. The dozen entrees she made included things I still sometimes yearn for. Especially the casseroles. Tuna Noodle Casserole. American Chopped Suey. Yes, it’s true. I may love going to foodie-type restaurants whenever I can, but I still want tacky casseroles like that for comfort food. Here’s another confession. When I started getting sick a few days ago, one of the remedies I took was … Tuna Noodle Casserole. It occurs to me that some people reading this might have some oh-so-understandable reactions to a pudding named Junket and casseroles consisting of tuna. Yes, I’m experiencing the cognitive distortion of Mind Reading now, imagining that for many of you, one-syllable sounds of judgment — such as Yuck! — are forming in your brains. By the way, sometimes when we guess what other people are thinking, we’re right. Nevertheless, I am now embracing, with pride, my love of the food my mother served me. Especially when i was sick. And with that thrilling declaration, I am now going to open up a can of chicken soup. Thanks for reading (no matter what your personal food preferences). If you noticed that yesterday’s blog post was a little more … how should I say it? discursive? rambling? spacey? … than usual, dear reader — I have an excuse. I don’t think I have The Flu. (I seem to be escaping that, thank goodness.) I think it’s just a cold. Two days ago on Saturday, the first day of the long weekend (of course), I came down with a sore throat and had a slight fever. And when I was writing yesterday morning, I was definitely feeling under the weather. And because I was sick, the following blog topic occurred to me: how illness affects my sense of self worth. So I guess I’ll take this opportunity to do some Reality Testing, right here and right now. That is, dear reader, feel free to leave me a comment on this post, answering these questions: When you are ill, does it affect how you feel about yourself? Does your self esteem — your sense of how worthy you are — get affected? If so, how? Well, I think that’s another first for me, in This Year of Blogging Daily — asking for a response from my readers, in a specific way. I enjoyed asking, I have to say. And it occurs to me, at this moment, to write this: If this blog is more — how shall I say it? — discursive? rambling? spacey? — than usual (and I know it is) what do you want from me? I’M SICK! And it’s super early in the morning, too. So, yes, it’s super early in the morning. I woke up at 3:30 AM, a little while ago, and my throat was hurting. And that leads me to the second “challenge” I named in the title of this blog. Oh, no! My throat feels worse! I shouldn’t have gone outside yesterday for a walk! What is the matter with you? Even though you felt a lot better yesterday, you should have known better than to start doing things that early! If you had stayed in bed all day yesterday, you would be feeling better now. You’ve probably screwed things up for this week, too. And you have so much to do at work and so many other things to take care of! Wow. That was actually kind of amazing to get those out of my head and into this post. A little harrowing, actually, but helpful. Okay! You’re having judgmental thoughts because you think you’ve made a mistake. And that helped a lot, dear reader, just to notice that and to Name It. And I got out of bed, got some orange juice, grabbed my laptop, and decided to write a post. I think I can go back to sleep now. Notice it, name it, and let it go, dammit!